Taverner POS is a free and open-source point of sale software system for use in public houses, bars and clubs. Touch screen operated the software offers backoffice management, menu modifiers, reporting, kitchen printers, manager facilities, multiple terminals, point of sale hardware support and cash terminal support. The TavernerPOS suite is a fork of Floreant POS, aimed at simplifying and streamlining work in public house and bar environments rather than larger restautants, and makes use of Floreant POS's 'TAKE OUT' ticket method for sales across the bar. This can be renamed to suit individual taste and requirements, for example 'Bar sales' from the configuration dialog menu. Other ticket types can still be used if required. NB: TavernerPOS is provided AS IS and without warranty of any kind. Use is entirely at your own risk. No claims are made as to fitness for purpose. TavernerPOS is a java application and runs on Windows, Linux and OSX. It is also possible to run the system through a web-browser using webswing. This enables tavernerPOS (or Floreant POS for that matter) to be used under Android or iOS (or anything else that supports a modern HTML5 browser) to support terminals on tablets. 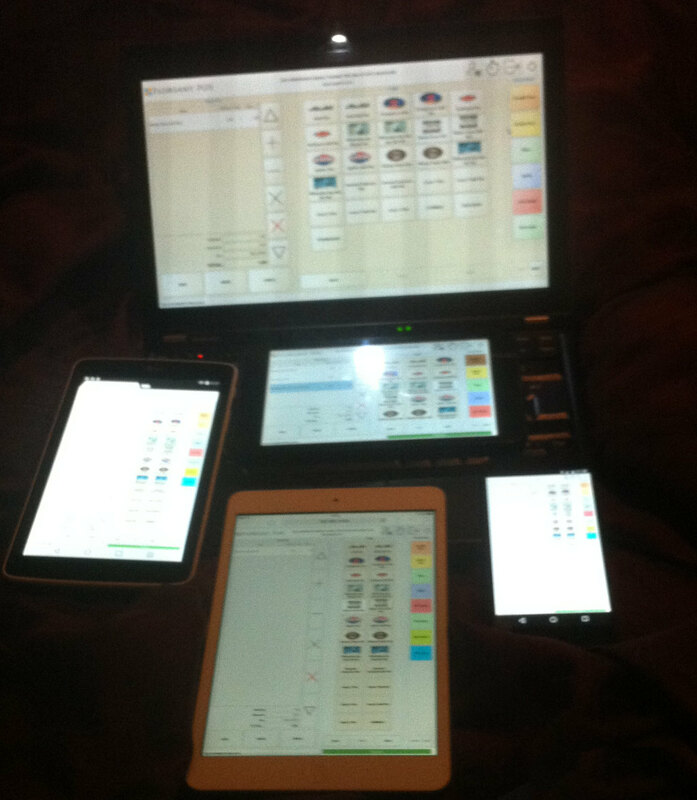 TavernerPOS 'running' on a Windows Laptop, an Android tablet, an Android Phone, an iPad and a Windows Tablet. It's working for me here on Windows 10 OK. Could you give me your operating system and possibly more importantly the screen resolution you are using and I'll try and reproduce it. (You can also edit the floreantpos.config.properties as a workaround). Could you tell me what that maximum resolution is so I can reproduce. I have added scroll-bars to the configuration pages. This should accommodate even the smallest resolutions. Thanks for your input. There is no inventory management system in this software... What to do now? Great work. 2 questions: a) how does hour extention work for reporting, e.g. where to configure it? And b) - yes, the inventory doesn't work anymore, at least not plugins intended for 1.4 build 705.
a) It's in the terminal configuration screen. b) Where can I get this extension to test it? Unfortunately the link had expired by the time I got to it. I'm guessing it's going to be versioning conflict and as it's proprietary there isn't much I can do about it. OROCUBE have never replied to any request or patch I've sent them, hence this fork. Can you please send me Inventory Plugin, I am running Floreant POS 1.4 Build 1702. I really need it because I like this system. No, because I don't have it and I don't believe it's open source. I've not changed any dBs so should be fine. Backup first though. Matt. are the two database tables different? I suppose it depends which versions you are running. Why not fire up mysql workbench and a look? I am running your your latest version, and it seems to be working very well until we realize that one of our staff wasnt been honest. 1. Customer orders drinks and food inside the restaurant, the agent create the ticket and save it for the customer to pay when they are finish eating. 4. customer dont realize that its not the final paid ticket they get, they just pay and throw ticket away. 5. after customer leave, the agent then edited the ticket and make changes to what the customer had received to smaller items, (eg. food for 50.00 to smaller food for $12.50). 6. then paid out the ticket for the smaller amount, throw away the ticket and then put the difference in their pocket. QUESTION: how can you prevent deleting from ticket after the ticket is saved? I want to inquire how can I change the program to use other fonts? I would like to use it in Europe and to handle the accented "É ÉÓÓÚÚ" letters in the program. Currency symbol can be specified in the configuration page. Accents should be able to be entered in the translation files, or directly into the program as needed. Do you plan to add an Inventory System soon, Excellent Program but I do not have any control over my stock, need something to add stock in, get reports on stock levels and stuff like that. Also, all servers share one cash drawer.. Is there a way to have a drawer for each server? Create your modifier groups, add your modifiers, In the "Edit menu item" screen, the second tab allows you to assign modifier groups and minimum and maximum quantities to each menu item. The modifiers then appear in the items selection menu when the the item is added to the ticket. Drawers are assigned to entire terminals, not to cashiers. II am not able to get table numbers to show. I have entered that I have 20 tables but when I go to open a new ticket and select a table number, it tells me no table number exist. Any iideas? The customer name is not displaying on the ticket list screen. Is there a simple fix for this?